№25377283 1 RF- Ostrich (Struthio camelus) male walking beside water, Etosha National Park, Namibia, June. №25192213 1 Snow geese (Chen caerulescens caerulescens) in flight in front of mountain, Wrangel Island, Far Eastern Russia, May. №27073661 1 African fish eagle (Haliaeetus vocifer) flying, Zimanga Private Game Reserve, KwaZulu-Natal, South Africa. №25803434 1 Mallards (Anas platyrhynchos) feeding in a city park. Washington, USA. November. №25213317 1 Kakapo (Strigops habroptilus) feeding on supplejack berries (Ripogonum scandens) Codfish/Whenua Hou Island, New Zealand. №25179223 2 Ruby topaz (Chrysolampis mosquitus) Trinidad and Tobago. №25192024 1 Snow geese (Chen caerulescens caerulescens) displaying, Wrangel Island, Far Eastern Russia, May. №25130027 1 Gentoo penguin (Pygoscelis papua) adult turning egg in nest, Saunders Island, Falkland Islands, November. 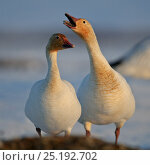 №25192702 1 Snow geese (Chen caerulescens caerulescens) pair in courtship display, Wrangel Island, Far Eastern Russia, May. 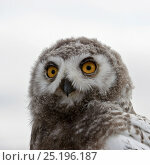 №25196187 1 Snowy owl (Bubo scandiacus) fledgling portrait, Wrangel Island, Far Eastern Russia, August. №25159897 1 West African wood-owl (Strix woodfordii) fledgling portrait, Cross River State, Nigeria.